We understand how difficult it is sustaining any water damage, mold or fire damage to your home. We strive to help you understand the process with direct communication between our staff, your insurance adjuster, and you. We are respected with insurance companies and can help to act on your behalf. Our goal is to make your restoration project as easy on you as is possible. Since 1973 our experience and commitment to excellence have earned us the reputation as the best Fire Damage, Water Damage and Mold Remediation company in the Sedona/Verde Valley area. 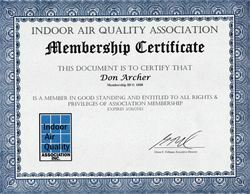 We are Licensed and Bonded, Council Certified, Microbial Mold Remediation Experts, certified by the American Council for Accredited Certification (ACAC) and Indoor Air Quality Councils (IAQ). We specialize in Water Dry-Out, Water Damage, Mold Inspections, and Mold Removal / Remediations as well as the complete remodel or room addition for your home. 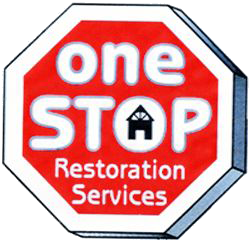 One Stop Restoration is committed to keeping your environment safe. As per EPA GUIDELINES, we set up containment of affected areas using a double flap entrance to keep all contaminant molds secured. Our products are completely safe to your health as well as the environment. We use negative air machinery/ air scrubber along with Hepa Vacuums to remove all contaminants. Special plastic bags are used to dispose of molded dry wall, insulation, etc. 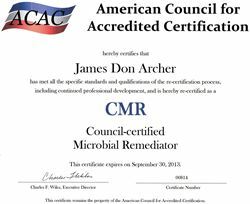 We are tested every two years to continue our certification with the ACAC for mold remediation. as well as changes in technology in our continued effort to keep you and our environment safe. During and after a Mold Removal, there are no Volatile Organic Compounds or VOC's on the sealant abatement assisted products. Mold Spores are resistant to our products as long as the area remains dry after our remediation. 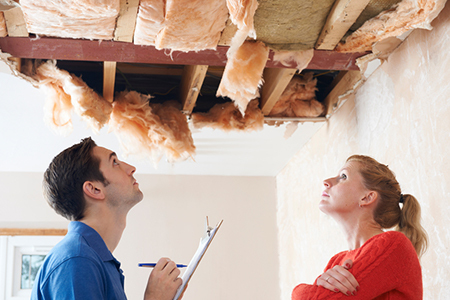 Whether you need a Water Dry-Out of your home due to a broken water pipe, or a Mold Inspection or an Room Addition or Remodel of your home, we have what you need at prices you can afford. Archer Construction has over 43 years experience as Structural Contractor, which includes water dry-outs, water damage, mold inspections, mold removal, or fire damage. Our goal is to provide you with courteous, expedient, professional service of the highest caliber. Our years of experience will be on your side as we plan and estimate your remodeling or restoration job. We would love to meet you to discuss your project. Call us at 928-853-1137 or email us today! Archer Construction and One Stop Restoration Services are committed to providing the best in customer service. We offer professional and friendly assistance to our customers for whatever they may need. That is why we are proud of our continued success in satisfying one customer after the other. Don't just take our word for it-be sure to read through our customer testimonials, and you'll see why we are the best in the business! "We so appreciate you all and what you have done to help us. And the help is not just the major remediation work but the interest in helping us physically and mentally. We truly have been going straight down hill physically - and of course our house was doing the same thing!" The federal government has a mold remediation specification that specifies the use of assessors and contractors who hold ACAC certifications. It is called the United Facilities Guide Specification (USGS 02 85 00.00 20 Mold Remediation.) This specification is a joint effort of the U.S. Army Corps of Engineers (USACE), the Naval Facilities Engineering Command (NAVFAC), the Air Force Civil Engineer Support Agency (HQ AFCESA), the Air Force Center for Engineering and the Environment (HQ AFCEE), and the National Aeronautics and Space Administration (NASA). The specification requires that a Certified Industrial Hygeinist (CIH) or a ACAC certificant act as supervisors for mold assessment on mold remediation contracts. Additionally, it specially names ACAC certificants as those eligible to perform the remediation contract. The American Council for Accredited Certification (ACAC) has the ONLY independent, accredited, board-awarded certifications in the IAQ industry! ACAC certification boards are composed of no less than five (5) members, each of whom holds the certification in question. Board members may not be affiliated with those who provide prep courses for ACAC exams. Boards meet and discuss each application file and certify by unanimous vote only. year certification cycle. In 2013, more than 90% of expiring ACAC certificants recertified in order to maintain their professional designations. ACAC has no revenue streams outside of certification fees. We do not sell advertising, books, products or curriculum materials of any kind. As a result, our reputation for integrity, credibility and independence is well known: The Federal government specifies ACAC certifications for mold workers in its Unified Facilities Guide Specifications. http://www.wbdg.org/ccb/DOD/UFGS/UFGS%2002%2085%2000.00%2020.pdf (see, for example, section 1.2.16; page 5, item 4; and page 34, item 4). The State of Maryland requires ACAC certification as a condition of licensing, requiring all license applicants to be certified by ACAC "or any other internationally recognized accreditation body that is recognized by the Maryland Home Improvement Commission (MHIC) and operates independently of training organizations or industry trade associations.” (Maryland Business Regulation Code, Title 8-701 (2012)s requirements. There are three major accreditation bodies (ANSI, CESB & NCCA). Only the Council for Engineering and Scientific Specialty Boards (CESB) accredits each and every engineering-based program on its own merits.